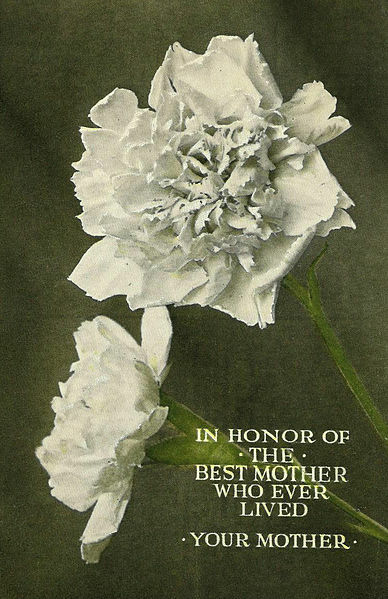 Normally, I’m pretty bad about recognizing Hallmark holidays, but today is no ordinary Mothers’ Day: it was 100 years ago this year that Pres. Woodrow Wilson first declared it a honorary holiday. So for the centenary I’ll be less misanthropic than usual and heartily wish all mothers among my readers a Happy Mothers’ Day! To love God. Unlike many evangelicals I don’t have a dramatic conversion story; but better, I have memories of being “loved into the kingdom” by parents whose love of their children modeled for those children the love of God. To serve others. I’m sure it’s because of my mom that I’ve never been able to separate love of God from service to the church: from superintending Sunday School to leading finance committees, with a thousand smaller tasks in between, Mom taught me that Christian discipleship cannot be done in isolation from a community. (It’s because of her that I’ve had a hard time taking seriously the argument that women have only a few, narrowly circumscribed roles to play within the Body of Christ.) And when Mom wasn’t at church or at home, she was serving as a nurse, first in a hospital and later for the Red Cross. I didn’t follow my parents into health care (Dad’s a pediatrician), but it was from them that I absorbed a desire to take up a profession that would let me serve others. To read. A voracious reader in her own right, Mom gave me my love of the printed word. I learned to read at a fairly young age, and Mom soon inaugurated the practice of leaving new books in the library for me to discover. Week in and week out, I came across novels and mythology, encyclopedias and textbooks… In particular, she nourished my interest in history, buying me not only books on the Civil War and the 20th century but a subscription to a wonderful magazine called Cobblestone. To cherish beauty and creativity. Mom is a wonderful singer, of everything from hymns to arias, and a multi-talented knitter/quilter/sewer. She is gifted in drawing, painting, and photography, performed dramatic monologues in church, and treats gardening more as artistic expression than utilitarian necessity. I have few of these gifts, but I did inherit Mom’s joy of living in a world created by a Creator whose intention, as John Calvin put it, was “to provide for our needs, but also for our pleasure and our delight.” And who made us as co-creators with him. First, Katie (like her mother — Happy Mothers’ Day, Dorothea!) has a selfless sense of duty to those whom she can help. I don’t know anyone else as quick to sacrifice their own comfort and convenience for the sake of others. Second, Katie is the most patient person I know. While she generally knows more about human behavior than anyone in my acquaintance, some humans are harder to understand than others. Four year old twins, for example. But while I’m losing my temper, Katie remains calm; while I’m mentally drafting ultimatums, Katie is explaining choices and gently maintaining boundaries. Strangely, my approach never works; hers always does. So in case my daughter comes across this as a teenager: Give up. You won’t win any of your battles with your mother. And if my son reads this: Take my advice and just accept that you’ve been born into a matriarchal society. Some day I will write a piece about and for each of my children and put in the safe deposit box for when I’m gone. Don’t forget to look!